Dry shade is one of a gardener’s biggest challenges. Combine this with a perilous slope planted with unsightly junipers, and many would throw up their hands in despair. Joanne Fuller of Portland, Oregon (USDA Zone 8b) instead saw opportunity. With hard work and perseverance, her problematic front yard was transformed into a glittering display of winter-blooming plants, with hellebores as the crowning jewels. The area is deeply shaded by mature oak street trees from mid-spring to fall, allowing little light or rain to come through. Because the steep incline made it difficult to maintain, an easy-care landscape that would thrive in all seasons seemed the best solution. Ruffled ‘Party Dress’ hellebores come in shades of white, cream and pink. Photo by Janet Loughrey. At the time of year when warm summer days and exuberant flower borders are but a distant memory, Joanne wanted a garden area that would lift her spirits after the long hours she spends as a public service employee. Since she passes by the tiny front slope each day on her way to and from work, it seemed the ideal place for a winter garden. The existing clay-based soil was rich in nutrients, so little amendment was needed. Gravel was added around some plants to enhance drainage. Joanne began planting Lenten rose (Helleborus x hybridus) seedlings grown by local breeders. 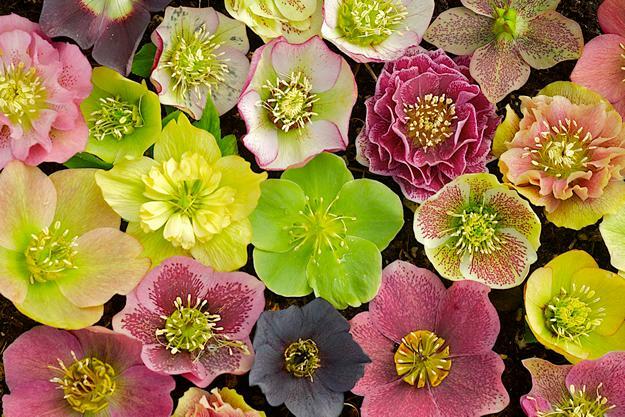 Hellebores are revered by seasoned gardeners for their long bloom time, reliability, evergreen foliage and tolerance of a wide variety of light and soil conditions. With flower colors ranging from cream to near-black, single and double forms, speckled patterns and veining, the diversity of blooms is astonishing. While hellebores are the stars, other plants such as winter hazel (in front of screen) also share the stage. Photo by Janet Loughrey. As her hellebore collection grew, Joanne tucked in minor bulbs of early snowdrop (Galanthus), grape hyacinth (Muscari) and species crocus. Witch hazel (Hamamelis mollis), sweet box (Sarcococca ruscifolia) and winter hazel (Corylopsis pauciflora) were added for their sweet perfume that permeates the air on milder days. One of the few drawbacks of hellebores is their downward-facing blooms, which makes it harder to appreciate their charming qualities. Joanne’s steep slope is the perfect site to enjoy the flowers up close. The steep slope allows for hellebores to be enjoyed at eye-level. Photo by Janet Loughrey. Because the garden is near the street and adjacent neighbors, Joanne wanted to create privacy without blocking the limited light. With the help of Laura Crockett (gardendiva.com), they designed a side fence and matching screens made of metal frames trimmed with bamboo and copper. Translucent panels were made from the same polycarbonate material used for greenhouses. The decorative panels, fence and adjacent copper sculptures retain heat and protect plants from wind, creating a microclimate near the house for extra-tender plants. Even though the emphasis is on winter interest, the front yard is attractive year-round. Shade- and drought-tolerant perennials, evergreens and shrubs provide color, structure and texture in all seasons. With the garden now established, there is little maintenance. Beds are raked of leaves and top-dressed with compost in spring to enrich the soil, suppress weeds and retain moisture. Hellebore foliage is lightly groomed before new flowers emerge. And that gives Joanne more time to enjoy the garden at a time of year when she needs it the most. If you enjoyed this article, make sure you don't miss our related sections in the reimagined Garden Design magazine. Landscape Solutions; where we present an in-depth look at how design techniques were used to resolve a specific problem—like Joanne's dry, shady garden with steep incline, and Plant Palette; providing detailed how-to-grow information on specific plants and also how to design with them, like these gorgeous hellebores.